You may not think of a dump truck as a tool in the normal seance due to the size. And most might think that a 4 axle truck with a 20ft dump body should be large enough. Well yes and no. at 20 ft you can fill the box with way more sand or gravel than you could legally haul weight wise. 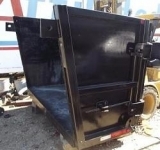 But just suppose you need to haul trash or crushed wooden buildings often called fluff and your dump fees are a set price no matter if you have an half empty box or a full one. when finished the truck returns and you spend 15 minutes removing the tailgate and installing the box while the customer is shouting please hurry you forget top take pictures of the completed project. Hey Thanks Frank for a way cool idea!!!! I love it. the length of the extension is limited to the distance to the ground in line with the floor of the dump bed when fully raised. one other thing is Here in Texas the lowest portion of the extension when the truck is on level ground must be less than 48 inches also the extension can extend no more than 48 inches from the rear of the truck or a DOT bar must be installed for this it would mean the bar would have to be folded in order to raise the bed. if in doubt it is better to check with your state's DOT. One last thing I built this at the behest of a long time customer and friend of mine. He told me that since having the extension added to his truck it paid for itself in the first month from the reduced amount of trips to the land fill, but the extension is an open invitation to be pulled over by the DOT for inspection when he is not pulling his trailer.